Cigarette bowling game | That Belongs in a Museum! 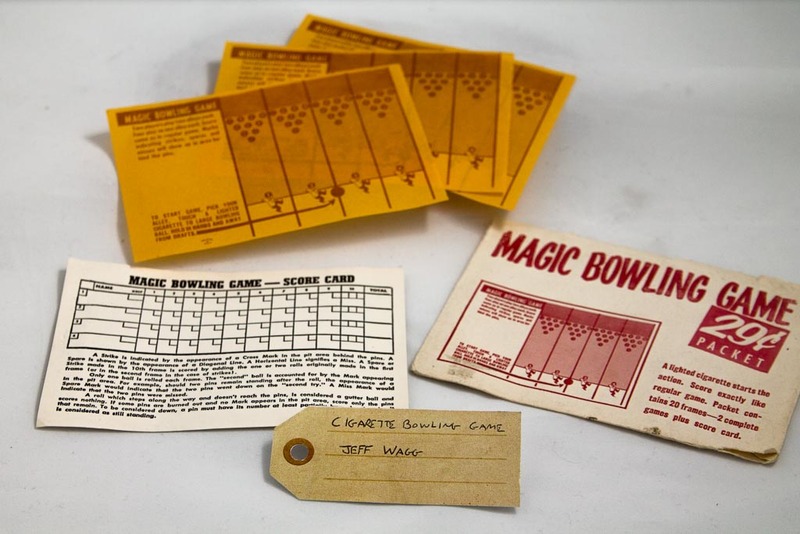 This is a magic bowling game…Now that we live in a world where cigarette smoking is kind of fading away, there’s a whole culture of cigarette smoking and cigarette behavior that we are going to lose. This object is one of those. There are these yellow pieces of paper that might have been white, I don’t know. But what you are supposed to do is you touch a cigarette to this point down here, and the paper will catch fire but in very specific places. What I think they did was put a flammable material in a path and that would be the “ball” rolling and it would slowly smolder toward the pins and you would score based on which pins burned.